It's time to continue with our work on the quiebro posture. Today we are going to take what I've been referring to as the rear quiebro (that is when the lower shoulder is rotated to the rear) and put it into a step for marcaje. By the way, I have no idea if it is correct to refer to this particular upper body position as 'rear quiebro' but just between you and me I needed to find a way to differentiate it from the opposite position (lowered shoulder rotated foward). So for now if you can bear with me I'll call it 'rear quiebro'. 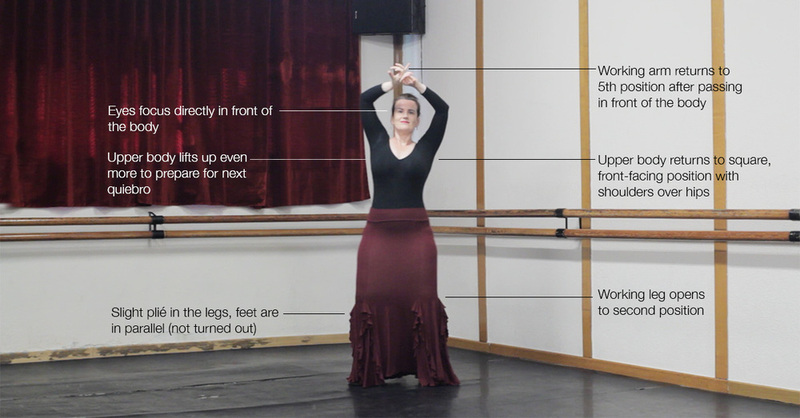 This step is based on a classic marcaje that I'm sure you have seen before. One arm opens out to the side in opposition to the leg which crosses in front of the body. To change from side to side you move through a wide second position of the feet and fifth position for the arms before repeating the movement on the other side. When your foot touches the ground after it has crossed in front of you, you will be in the quiebro posture with one arm down in front of your stomach. This step with out quiebro is relatively basic, with quiebro it is quite advanced and you will see in the video below that I don't hit the quiebro posture every single time. Have a look at the 3 images below to see what we are going to do. Each photo above represents a position that you need to hit in compás each time you do the marcaje. When you dance imagine there is someone who is going to be taking a photo of you at each of these beats. The beat in question is the first of three beats. When you watch the video you will hear José giving me palmas for a 3-beat cycle. Have some patience with yourself, work slowly and try to be very clear about how your body changes from one side, to center and then to the other side. One big thing that I learnt from José while we were filming this video is that during practice I wasn't being clear about where I was focusing my eyes. Rather than thinking about moving my head, José told me to think about where I was looking and what I was focusing on. For this step there are three very different points of focus, make sure you take the time to feel and understand them. It will make a huge difference to the clarity of your movement. I'm also trying out something new with video - voiceover! Let me know what you think is it helpful?